On Tuesday February 27, 2018, Georgia Southern University’s Center for Sales Excellence will hold its second annual Sales Showcase Boot Camp. 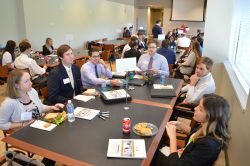 The Sales Showcase Boot Camp is designed to allow graduating sales students an opportunity to learn through rotating sessions, interacting with sales professionals from Aerotek, Briggs Equipment, C.H. Robinson, Enterprise, Insight Global, Mutual of Omaha, Nolan Transportation, OTR Capital,Tom James, and Granite Telecommunications. The sessions will last 25 minutes each and professionals from each company will rotate around the room working to answer a list of questions recruiters found hardest for new graduates to answer. After the event, sponsors are also able to dine with students for more face-to-face time. Last year, sponsors and students equally agreed the best part of this event was the companies looking specifically for sales students and students interested in sales were able to network in order to build relationships leading to employment and a greater preparation for what is to come upon graduation. For more information about this event, please call Dr. Linda Mullen at 912-478-3597.